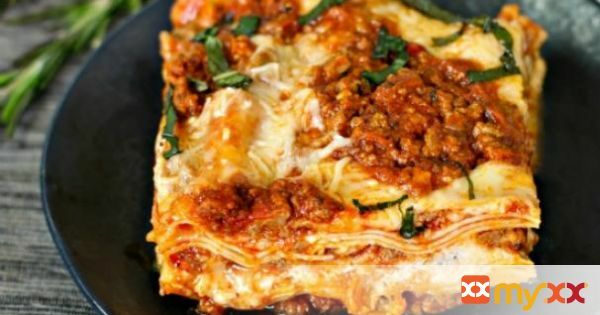 This Best Lasagna Recipe has taken years to perfect! It is ridiculously rich, meaty, gooey, cheesy and makes the perfect comfort food! 1. In a Dutch oven, cook sausage, ground beef, onion, garlic and salt over medium heat until well browned. 2. Drain meat and stir in petite-diced tomatoes, tomato paste and tomato sauce. 3. Season with sugar, basil, parsley, Italian seasoning, salt and pepper. 4. Simmer on low heat, covered, for about 1½ hours, stirring occasionally. 5. Bring a large pot of lightly salted water to a boil. Cook lasagna noodles in boiling water for 8 to 10 minutes if you aren’t using the no-boil variety. 6. Drain noodles, and rinse with cold water. 7. If you are using the no-boil variety, you don’t have to do any pre-cooking. 8. In a medium mixing bowl, combine ricotta cheese, egg, salt, pepper, garlic powder, parsley and ½ cup Parmesan cheese, mix well. 9. Then, quickly stir in ¼ cup meat sauce into the ricotta mixture, which makes it easier to spread on the noodles later. 10. Preheat oven to 375°F. 11. To assemble, spread 1½ cups of meat sauce in the bottom of a 9x13 inch-baking dish. Arrange 6 noodles lengthwise over meat sauce. 12. Spread with one half of the ricotta cheese mixture. Top with a third of mozzarella cheese. 13. Spoon 1½ cups meat sauce over mozzarella, and sprinkle with ¼ cup Parmesan cheese. 14. Repeat layers, and top with remaining mozzarella and Parmesan cheese. 15. Cover with foil (to prevent sticking, either spray foil with cooking spray, or use non-stick foil). 16. Bake for 30 minutes. 17. Remove the foil, and bake an additional 15-20 minutes. 18. Cool for 15 minutes before serving.